Even in an arena with rocket-powered cars, players find ways to pull off incredible football-like maneuvers. Of the teams attending the Rocket League Season 3 World Championship Series this weekend, NRG has been one to watch. 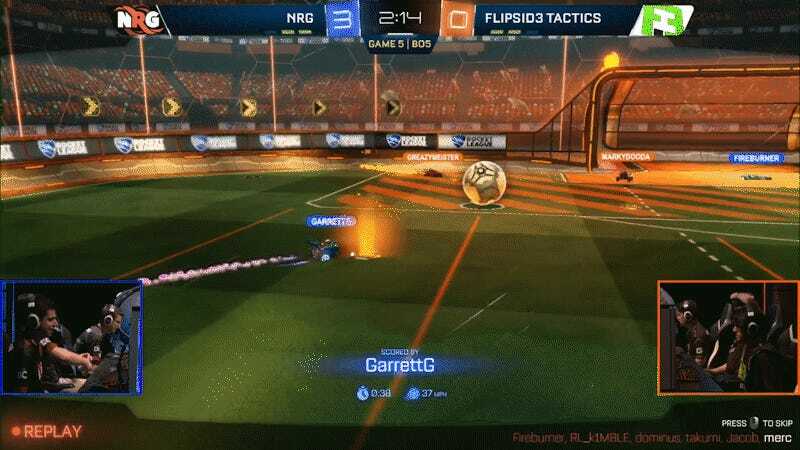 The top seed from North America, NRG executes full-on plays and works really well together, like in yesterday’s game against FlipSid3 Tactics. Jayson “Fireburner” Nunez comes in off the wall, screens and then demolishes one defender, leaving Garrett “GarrettG” Gordon to fake-out two players with a stutter-step before knocking the ball in. It’s gorgeous to see in motion, and shows the amount of trust and rapport these players have with each other. With a win against FlipSid3, NRG has now beaten the team that eliminated them at last season’s finals and guaranteed itself a spot in the top three. Games at the World Championship Series continued later today, where FlipSid3 will be playing up through the loser’s bracket and NRG will try to secure a grand finals berth in the winner’s finals against Mock-It eSports EU.